It’s like setting the clock back…as it works for a more youthful appearance by removing major wrinkles and sagging skin by tightening of the facial and neck muscles as well as the removal of any excess skin. As people age, the effects of gravity, exposure to the sun, and the stresses of daily life can be seen in their faces. Deep creases form between the nose and mouth; the jaw line grows slack and jowly; folds and fat deposits appear around the neck. Not only does a facelift improve facial appearance but also has a dramatic effect on the neck, enhancing its contour and profile. A face lift is frequently performed in conjunction with blepharoplasty (eyelid surgery), forehead lift, chin augmentation, and/or liposuction to create an overall rejuvenation of the face. The procedure can be repeated as gravity continues its effects after the first surgery. 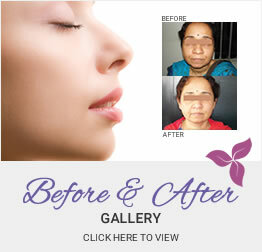 There is no specific age for having a facelift. The results of a facelift can be subtle or very dramatic depending on the patient’s appearance before surgery. What is an endoscopic midface lift? Endoscopic or minimal- incision surgery is performed using a tiny fibre optic lens inserted through small incisions placed in the temple and in the mouth. What are the endoscopic facial surgery? The main benefits of endoscopic surgery include : no visible incisions, minimal scarring, less bleeding, no hair loss, minimal numbness and a much quicker recovery. You should be up and about in a day or two, but I suggest to take it easy for the first week after surgery. Be especially gentle with your face and hair, since your skin will be both. You'll look and feel much better after 15 days. I find most patients getting back at work within ten days to two weeks after surgery. Notwithstanding the fact that having a facelift doesn't stop the clock, you'll continue to look better even years after the surgery. Sounds lovely, isn't it?